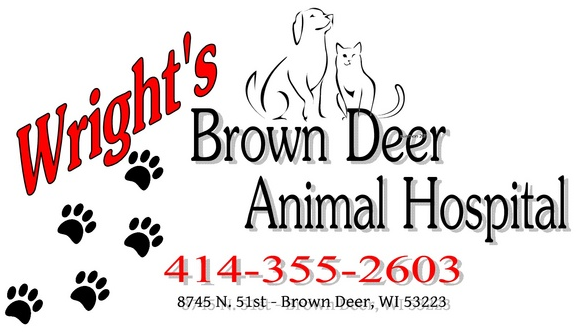 Wright's Brown Deer Animal Hospital is a full-service veterinary hospital dedicated to providing quality medical, surgical and dental care for your pet. Dr. Wright neutered my dog, has given him all of his check-ups, vaccinations, etc. My dog is never afraid to go to the vet! The doctor is most personable, & thoroughly explains everything. Very glad to have a caring & great veterinarian! Thanks! Dr. Wright takes care of all of my parent's dogs and my puppy, Marley. Absolutely amazing! Great service, very timely, even same-day appointments. Love it! Dr. Wright is a fantastic veterinarian, caring not only for animals, but their owners peace of mind as well. Brought our tabby cat in as he was having issues, and he walked through the process with us, made sure we knew all of our options and was incredible with our cat. If you have a pet that hates vets but needs treatment, Dr. Wright is your answer. Since getting my puppy I was excited to find a vet with late hours on Tuesday's and Thursday's. My puppy doesn't love going to the pet (who would) but Dr. Wright does a great job keeping her relatively calm. Dr. Wright is not only good with your pet, he's also good with pet parents too. Highly recommend getting your pet seen here! ​ ~Marian Q.
I definitely recommend Dr. Wright for veterinary services. He actually sat down with me in the room with my dachshund and listened to me and looked over previous records for my dogs and explained everything to me. He was very nice and listened toe and the concerns I had. I will definitely be going back and have recommended him to friends and family. His staff was also very nice!